It was several months ago that I was contacted by a reader of the blog who had several questions regarding a few collectible items, and after exchanging a few emails with her I quickly realized that we had several things in common. 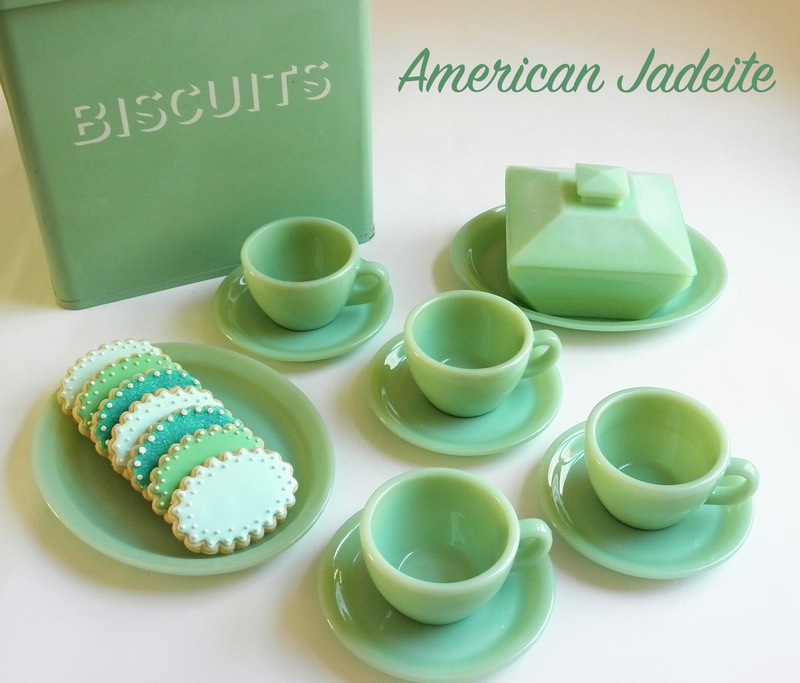 I found her to be a serious collector of Martha by Mail cookie cutters, along with other kitchen wares from the former catalog (as you know I am! ), but little did I know that she was also a fellow blogger. I wasted no time in visiting her site when she told me about it. From the moment I looked at her photography, ideas and cookies, I knew I was onto a 'good thing'. I came to understand that Janet had been blogging for quite some time and that her following was an established one; her ideas continue to inspire many. Over the course of the past few months I've gotten to know Janet a bit more and I think we've come to an unspoken agreement that we love the little things that make our lives good. For Janet, the cookies she creates for loved ones, friends, co-workers and great causes are truly little pieces of art that she enjoys making. With a well-stocked kitchen filled with the many accouterments required to make the best cookies, Janet ices batch after batch of fun-shaped cookies in the most vibrant colors. She bakes like a professional in her kitchen. 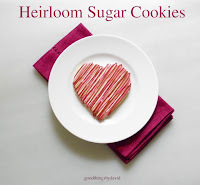 I asked my friend if I could showcase some of her ideas & photography for all of my readers to get inspired this holiday, and lucky for us she kindly agreed to share a few choice images of some marvelous cookies that she has produced over the past several months. 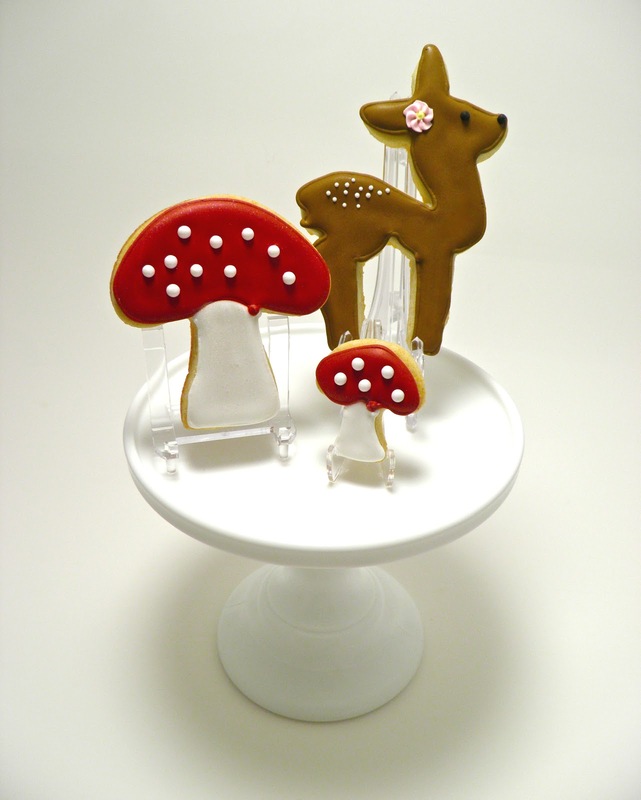 When you look at the beautiful reindeer, woodland mushrooms, penguins and other treats she has created using her collectible cutters which she is passionately amassing, you too will be inspired to bake some holiday cheer this season. 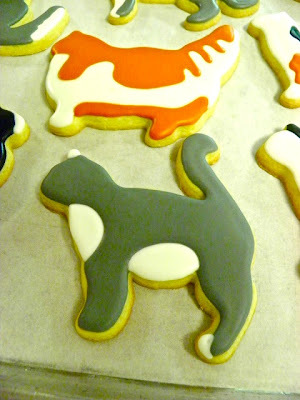 Let's have a look at some wonderful cookies by Janet. 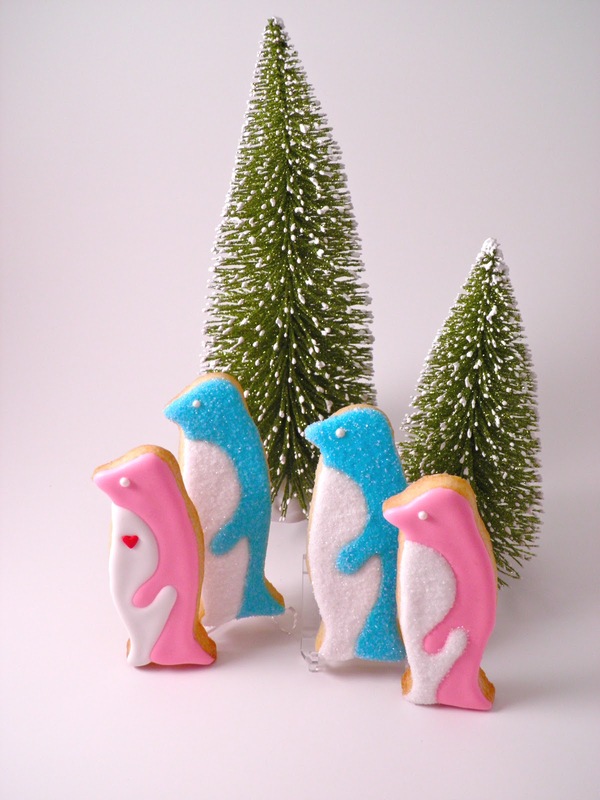 This little quartet of charming penguins was getting ready for a good cause. Janet was going to a blog conference sponsored by OXO (that fabulous kitchen wares company) and they asked every participant to bring their favorite cookies to auction off. All proceeds were going to help fight pediatric cancer! This was when I knew I had to have Janet on the blog. Sweet treats for a good cause, what could be better? Packaged into appropriately-sized cellophane bags and tied with pretty ribbons, each pink penguin with its candy heart was also tagged with her motto: Have a Sweet Life! 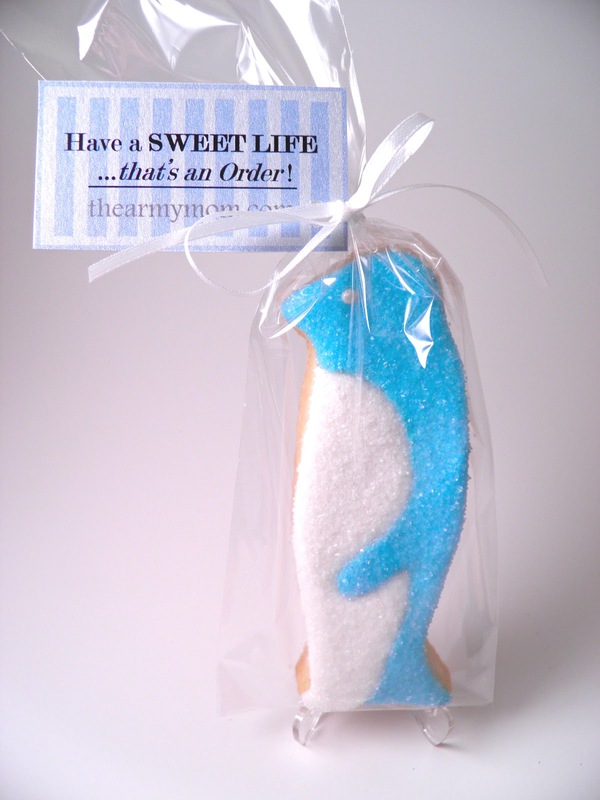 An ice-blue penguin that's been flocked with fine sanding sugar is ready to march into someone's life. It isn't too difficult to give back in some way and believe me, these small gestures mean a lot! Like a true professional, Janet works over a plate to catch the clear sanding sugar as she flocks each cookie. Can't you just imagine a small army of these Christmas penguins for your holiday desserts? These would also make wonderful ornaments if you wanted to have a one-of-a-kind tree for the season. Use pinks, reds, greens or whatever colors you happen to like! This delicious cookie dough (which has been rolled out onto a marble surface with plastic wrap if I'm not mistaken) is being cut with a giant Christmas tree cutter from the former Martha by Mail catalog. Hmmm, I wonder who the lucky recipient will be? Once baked to perfection, the beautiful evergreen will be iced in some spectacular way with Janet's finesse. Oh by the way, she loves her Le Creuset cookware. A lime-green braiser is sitting next to one of her prized round dutch ovens. Look at these beautiful cookies? Have you ever seen such a vibrant and most delicious mushroom in your life? That little chocolate-colored deer almost seems ready to take flight. I love this family of deer cookies with their pretty sugar flower embellishments. They look like the ones we see around my home. 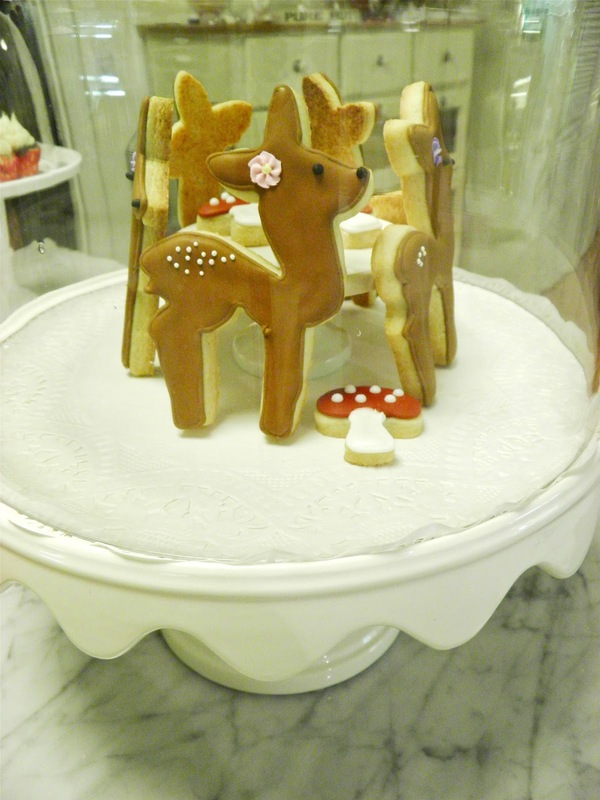 Janet loves this Martha cake stand with glass dome. I have a feeling it gets used a lot throughout the year to house special treats for her family. 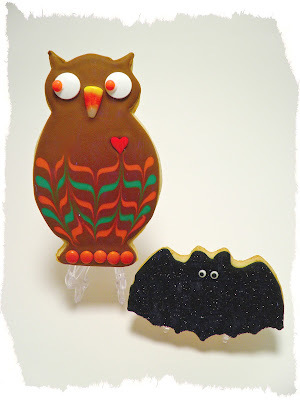 For Halloween, a Bat & Owl cookie duo in autumnal colors made for some spooky and clever goodies. With a few color changes and different embellishments, Janet created a whole set of these for Christmas. Visit the charming Christmas Snow Owls on her blog and get ideas for your decorations. After having acquired a set of copper cat cookie cutters, a few sheets of sugar cookies were baked in such adorable feline shapes. 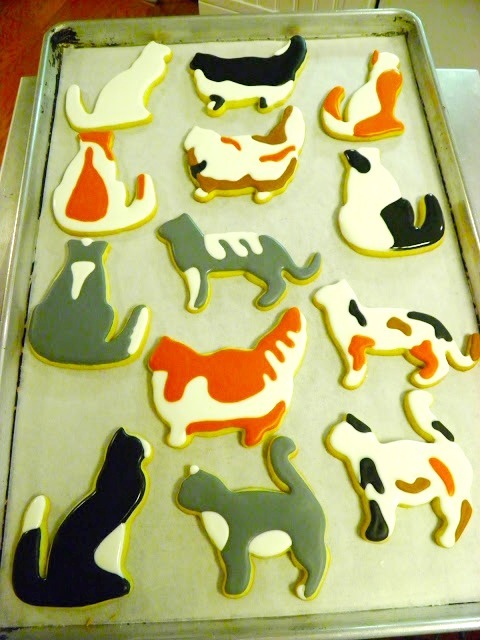 Here they are sitting on a cooling rack awaiting their icing. Aren't the kitties just about the cutest things you've ever seen? If you're a cat lover just as much as I am, you'll agree that these little cookies are perfect for anyone who adores the pitter-patter of little cotton ball feet. Janet made them for the wonderful people who helped care for her kitty cat, Bing, who recently departed (I know he's missed immensely). 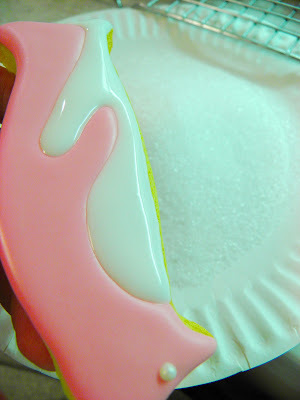 If you click on the link above you will discover a flurry of snowflake cookies that were recently iced. Trust me, you'll want to make a set of these for your Christmas party this year. 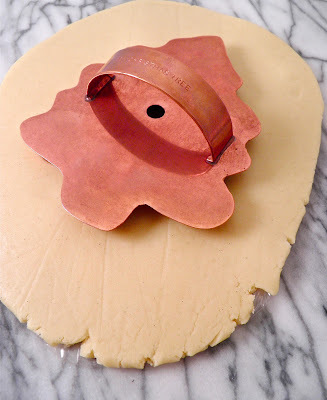 Gather your cookie cutters and begin making batch after batch of cookie doughs this weekend. Make a list of everyone in your life who would appreciate a good cookie and start baking. When you're ready to ice the cookies, let the wonderful images and ideas from Janet guide you and inspire you in creating the most exquisite treats imaginable. Package them into cellophane bags, tie them with a nice ribbon to make them even more special and then send them on their way. Everyone is going to want one! Thank You Janet for inspiring us. Cheers to you! Your mention of Bing has me sitting here in a puddle. Thank you, love! You are a true-blue friend and the ways you've inspired me are truly too numerous to count! Janet, Thank YOU for inspiring many of us. Bing seemed like the greatest little guy. Janet is always a sweetheart, and you've chosen some great images that show how her sweetness extends outward to her friends & community. 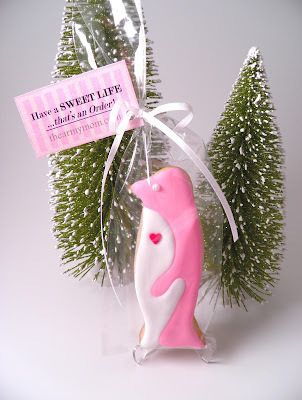 Love those penguins & cute little deer! I love Janet and her blog! She is a stickler for paying attention to detail and capturing it all be it on her wonderful cookies, in her gardens, her home and even when cleaning her car. One of the sweetest perfectionist you could ever meet with a heart as big as the moon! 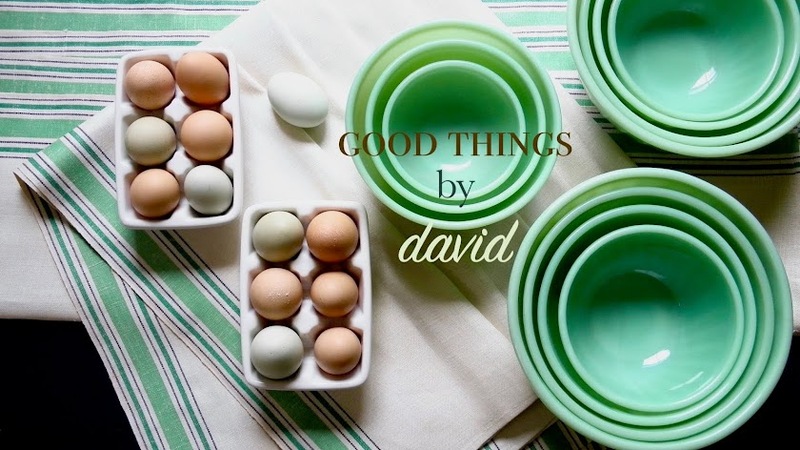 Janet inspired me to follow your blog, David. I enjoy it immensely! Thanks for sharing Janet's talent with your audience; I look forward to everything she creates. Oh my, an inspiration to all of us Martha by Mail copper cookie collectors! I feel like such a rookie and am in awe of her skills. Thank you for this beautiful post. I'm glad you liked my write up of Janet & her many talents. Yes!, the fact that she shares & gives back is what prompted me to have her showcased here. I like to share Good Things and Janet's creations are certainly that! Paula, Joy & Nancy, I couldn't agree more with your sentiments. Here here! How nice that you've managed to collect these cutters! Thanks for the tip, I'll be sure to keep my eye out for them.